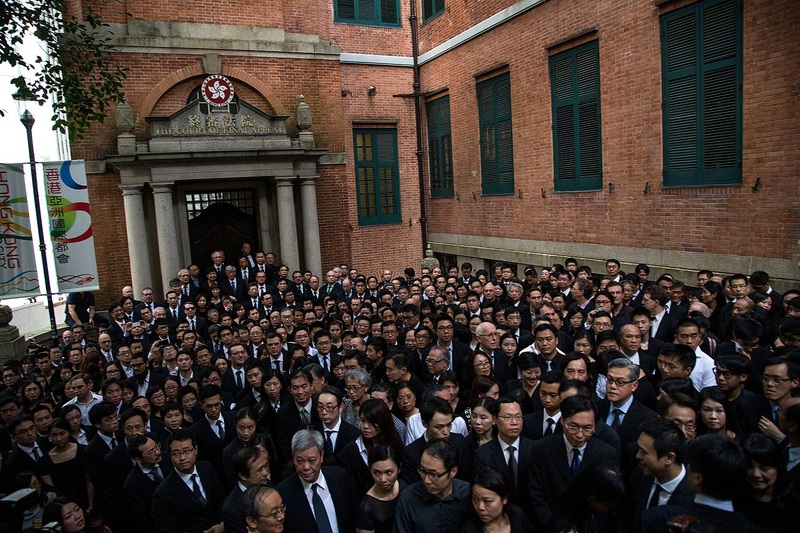 Hundreds of Hong Kong lawyers protest the Chinese central government’s assertion of ‘comprehensive jurisdiction’ over Hong Kong, in a silent march from from the High Court to the Court of Final Appeal in Central, Hong Kong, June 27, 2014. This piece is based on remarks given by the author at the Council on Foreign Relations on March 9, 2017. The state of Hong Kong’s rule of law has been argued over since well before the city’s reversion to Chinese sovereignty in 1997. However, developments in recent months, such as the Hong Kong government’s recent spate of vague charges against pro-democracy politicians and activists, have given new urgency to the debate. But a key idea persists, namely that Beijing should, or will, maintain rule of law in Hong Kong because doing so is “good for business.” In a 2013 speech entitled “The Future of Hong Kong: A Legal Perspective,” Hong Kong’s Secretary for Justice Rimsky Yuen declared that Hong Kong “should position herself as a center and regional hub for legal services . . . and dispute resolution in the Asia Pacific region,” because such a policy is “in the best interest of Hong Kong and indeed the Mainland.” In a similar vein, in April 2017 the president of the American Chamber of Commerce in Hong Kong urged Chief Executive-elect Carrie Lam to, as the South China Morning Post put it, “give assurances over the continuation of the rule of law,” in an effort to market the city to international businesses. The idea that Beijing will preserve Hong Kong’s rule of law to maintain its status as a financial and investment hub is superficially attractive. Numerous institutions, including the World Bank and Cato Institute, rank jurisdictions’ business regulatory regimes based on the assumption that the existence of the rule of law underpins a friendly business environment. However, the emphasis on justifying rule of law in purely commercial terms has a fundamental problem: it suggests that rule of law is only beneficial insofar as it is beneficial to business. Secretary Yuen, for instance, said nothing at all in his 2013 speech about public law or criminal justice. That omission was no accident. Faced with the competing demands of attracting investment and political control, many authoritarian regimes have tried to confine the trappings of “rule of law” to the commercial world, while restricting rights in “politically sensitive” areas—a system described in academic literature as the “dual state.” Under a “dual state,” investors can expect a reasonable degree of legal protection, at least for as long as the regime is prepared to tolerate it. Fraenkel’s account may seem far removed from developments in Hong Kong. Yet there are disturbing signs that the territory’s legal system may be moving in the direction of a dual state, and that Beijing’s increasingly capacious definition of “national security” is the major driving force behind these developments.
. . . the relative absence of international or domestic threats to the state’s power to govern, sovereignty, unity and territorial integrity, the welfare of the people, sustainable economic and social development, and other major national interests, and the ability to ensure a continued state of security. Similar ideas underpin Beijing’s various pronouncements on Hong Kong policy over the past several years, including the State Council’s 2014 white paper, the 2014 Decision by the National People’s Congress Standing Committee (NPCSC) on Chief Executive selection, and the steady stream of vitriol directed at localist and pro-independence politicians in Hong Kong. Beijing’s determination to control Hong Kong politics has resulted in growing pressure to create a prerogative state within the territory. The mainland government and its proxies have repeatedly attempted to bring the Hong Kong judiciary to heel in “political” or “sensitive” cases, employing three different tactics. First, the NPCSC has not hesitated to deliver “interpretations” of Hong Kong’s Basic Law of its own accord, effectively short-circuiting pending or imminent litigation in Hong Kong—or even, as occurred with the 2016 “interpretation” relating to oath-taking by legislators-elect, dictating outcomes to the Hong Kong judiciary. Second, pro-Beijing actors have consistently sought to “other” Hong Kong’s common law system and protection of rights, for instance through race-baiting rhetoric directed at judges not of Chinese ethnic descent or references to the common law as a colonial relic overdue for replacement. And third, Beijing has overtly demanded political loyalty from Hong Kong’s judges. Xi Jinping’s reference to “mutual understanding and support amongst the Executive, the Legislature and the Judiciary” in July 2008, and the reference in the State Council’s 2014 white paper to judges as “administrators,” both fall into this category. Notably, some of the most belligerent rhetoric in favor of the creation of a dual state in Hong Kong has come from mainland legal academics. Speaking at a conference on “One Country, Two Systems” in April 2017, Wang Zhenmin (legal affairs chief of Beijing’s Liaison Office in Hong Kong and a former Dean of Tsinghua Law School) threatened that “One Country, Two Systems” could be abolished altogether if the city “fails to actively defend the sovereignty, national security and development interests of the country in accordance with law.” At the same conference, Peking University law professor Chen Duanhong suggested that Hong Kong residents of foreign nationality who supported the Umbrella Movement, or who support Hong Kong independence, should be expelled from the territory. In a similar vein, Wang Liwan, a former colleague of mine at New York University, has suggested that the Basic Law’s protections for freedom of expression be “interpreted” to exclude any form of “advocacy for Hong Kong independence,” a term which he uses to tar even modest proposals for democratisation and the preservation of Hong Kong’s autonomy. These statements suggest that Beijing is seeking intellectual cover for the abrogation of “One Country, Two Systems” in Hong Kong. This in turn would pave the way for the imposition of a dual state regime on the territory. A common response to the existence of a dual state is the admonition that one should accept the limitations of the dual state and steer clear of “political” matters. Wang Zhenmin’s threat, referred to above, is a prime example. However, such a response presupposes the ability reliably to determine what matters are “political.” In reality, the dividing line is, by design, vague and liable to change. Nor is the prerogative state content to confine itself to the realms of civil and political rights. The government’s attempts to exclude political opponents from economic life serve as a prime example. One would assume that it is “good for business” to be able to incorporate, to open bank accounts, or to do business, without being subject to arbitrary restrictions. However, the host of regulatory hurdles faced by democratic and localist politicians suggest that Hong Kong’s regulatory environment is only friendly to the politically pliant. For instance, due to the absence of specific legislation governing the registration and conduct of political parties, such parties typically register as companies with the Companies Registry, which normally takes only several days to approve a registration application. However, the Registry spent months obstructing an application by the Demosistō political party, led by activist Joshua Wong. (The application has still not been approved.) (The Registry previously refused to allow the Occupy Central civil disobedience movement to incorporate altogether.) Democratic and localist parties have also encountered difficulties in opening bank accounts, likely due to political pressure on the city’s financial institutions. Governmental roadblocks even extend to the ability to sell merchandise. In January 2017, the Food and Environmental Hygiene Department barred the localist Youngspiration party from the Chinese New Year fair, ostensibly for “public safety” reasons. The message sent by these measures is clear: strangling political opponents’ ability to raise funds is more important than maintaining a level playing field for business. Nor should larger commercial enterprises view themselves as exempt from the reach of the prerogative state. Two court cases on the immunity of foreign states and People’s Republic of China (P.R.C.) governmental entities, respectively, serve as cautionary examples. In the FG Hemisphere litigation, a vulture fund attempted to enforce debt owed by the Democratic Republic of the Congo (D.R. Congo) that it had purchased. In doing so, it lay claim to money located in Hong Kong that was due to be paid to the D.R. Congo. Unfortunately for the vulture fund, that money was part of a major Chinese state-owned enterprise’s Congolese investment project. As a result, the Chinese Foreign Ministry attempted to intervene at every stage of the litigation. The case ultimately went to the National People’s Congress Standing Committee, at the request of the territory’s Court of Final Appeal. In its first and so far only “interpretation” of the Basic Law done at the Court of Final Appeal’s behest, the Standing Committee “interpreted” the Basic Law to bestow blanket immunity on foreign states, such as the D.R. Congo, before Hong Kong courts. Not surprisingly, this outcome happened to shield the Congolese investment project from the vulture fund. In the Hua Tian Long case, the Guangzhou Salvage Bureau, an arm of the P.R.C. Ministry of Communications, contracted with a client to use a crane barge the bureau owned, called the Hua Tian Long. When the bureau failed to fulfill its contract, the client filed a lawsuit in a Hong Kong court. The bureau’s defense argued it enjoyed immunity from the suit in Hong Kong because it was a part of the Chinese government. The Court of First Instance held that the bureau was entitled to immunity, although it had waived immunity in that particular case. [T]here is a legitimate concern that, where a counterparty is a foreign State or the PRC government, the Hong Kong courts may not be the best forum for any potential dispute. The examples discussed above suggest that Beijing’s posture toward the rule of law depends far more on maintaining political power, frequently under the rubric of “national security,” than on what is “good for business.” More significantly, there are signs of the metastasis of “national security” in official policy. The definition in the National Security Law, discussed above, is already broad enough to be effectively meaningless. Yet other provisions in the Law go further, stating that national security includes protecting “the order of the socialist marketplace” and “resisting negative cultural influences.” Such an expansive notion of national security suggests that any number of activities, from shorting stocks to importing Peppa Pig, might be arbitrarily reclassified as a national security threat. Against that background, Secretary Yuen’s vision of the future of Hong Kong’s rule of law seems much less compelling. In the face of a political climate in Beijing that is increasingly hostile to perceived threats, and that is willing to define virtually any dissent as endangering national security, purely commercial defenses of Hong Kong’s rule of law will likely fall on deaf ears. Unless Secretary Yuen and others begin justifying the preservation of Hong Kong’s legal system in non-commercial terms, the best outcome they can hope for is the creation and consolidation of a dual state in the territory—a regime which ultimately offers no legal protection for any individual, in any sphere of activity. Correction: An earlier version of this article misattributed the quote “give assurances over the continuation of the rule of law.” This quote should be attributed to the South China Morning Post.